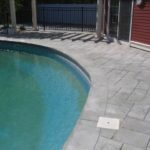 Stamped Concrete Yellowing – Styrene Acrylics – We utilize a quality stamped concrete sealer to avoid this – See photo below left for yellowing stamped concrete pool patio deck. Avoid applying too much sealer, cheap sealer or wrong type of sealer. Don’t permanently damage your project. This results after the contractor is long gone. NEW revolutionary product!!! Restores “like new” appearance where sealer exists. 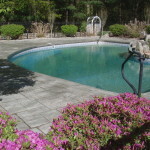 Gloss Restorer- Restores original shine, luster and beauty to stamped and decorative concrete pool patios, driveways and walkways. Call Now and avoid the use of substandard, cheap sealer from being applied on your stamped concrete project and reserve your spot now! 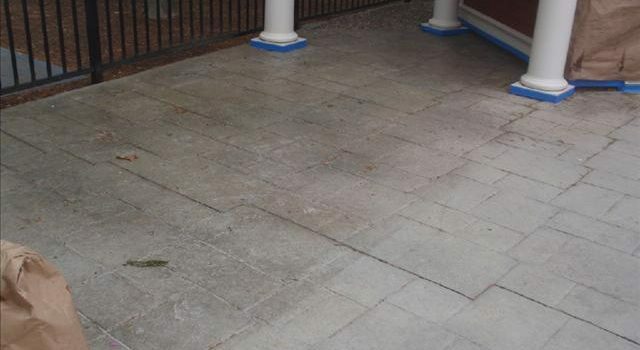 Concrete sealer was removed via special blasting technique – We no longer remove sealer, as its too costly, timely and labor intensive. 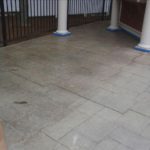 Improper concrete cement cleaning and concrete cement sealing-Sealer Compatibility Issues-Substandard Concrete Cement Surface Cleaning and Sealing. Concrete Sealing Issues (Before) Avoid this and call the Professionals at BCSC. More testimonials….